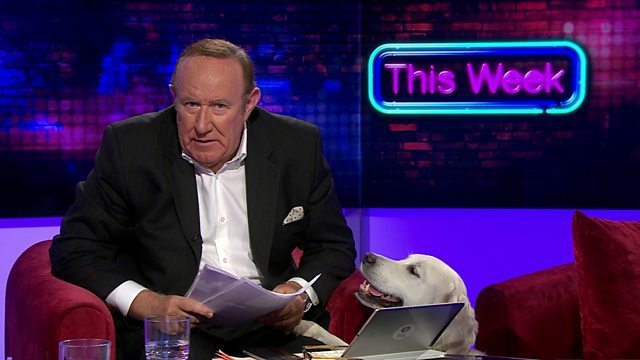 Andrew Neil reviews the political week with Michael Portillo and Lisa Nandy, plus Liam Halligan rounds up the headlines. Studio guests are Alexander Nekrassov and Jerry Springer. heading for a new Cold War? history. We've got to fight back. There's only one way to fix it. when she visited Salisbury today. seems to be bedding in nicely. I can see where Jezza's coming from. to one of its colonies. jobs and your cat were watching. not such a bad place. I mean, I can see why he's miffed. I'll bet you would be too. of donating a single kopeck. succeeded in splitting Nato apart. spring statement, free school meals. good thing for the country. to announce when that happens. with his Take of the Week. a message to President Putin. "in London to get frisked. Johnson going to your World Cup". but London isn't buying it. after spooks who've been exchanged. in the Soviet Union in the 1970s. so she had no choice but to act. And she sent an ultimatum to Moscow. or your diplomats get it". are going to the World Cup. in Salisbury is a grave one. And Alexander is with us now. What would the reason be? if there wasn't a clear motive. they kill each other randomly. all of the streets around you. about the spread of Novichok. it as a weapon is Russia. stuff that was found in Salisbury. are dictating terms to the west. That is a popular message. take seriously, in my view. election, which causes a problem. attacked and has been badly injured. The election is a farce. he need to do this. strongman we think he is? man who is not even known in Russia. grade. There is no point. fish as well. Why was he murdered? nothing to do with it at all. don't have time for that. Who he, I hear you ask? was impossible to single out. what the word clone means. on a chilly March evening. the truth puts its boots on". seemed to bear this out. of course, was false political news. and the truth is out there. I'm sure we'll find it one day. and investment in the years ahead. for a springtime spending boost. for the succour of state largesse. for the right honourable gentleman. of his hero, Chairman Mao. in an ambulance before he acts? She gave Putin a midnight deadline. into the hands of others. as on the British government. the Prime Minister was adamant. They have just one week to leave. state has acted against our country. attack, to run its own tests? a robust dialogue with Russia? girls, in her Telford constituency. as bringing it on themselves. for what is happening to them. A lesser spotted Lib Dem? to brand all Brexit voters racist. Springtime, or a new yellow dawn? across the sea from Brussels. the slogans, the sound bites. It's time to face up the hard facts. Phoenix must be about to hatch. point about where the money years. clamp down on that money. far enough on that, have they? why they have kept some stuff back. because he does not like the West. in particular, does not like Nato. So he is being consistent. fair, he has been cleared today. today have all been clear. not be able to hear. Do they continue to speak up? no right to be cheerful at all. they are not written on. thing which is really important. national shame. Do you agree? change. Let's hope it is changing. very aware of this now. was the Jerry Springer Show. and I Slept with the President". Obviously, I made that last one up. right perceived or hushed up wrongs. it is tough at the top. they all fight back at once. stays on top for long. We are still fighting the fight. than we thought but we did it. Let them call you racists. Let them call you xenophobes. Let them call you nativists. Wear it is a badge of honour. for change for a long time. have done these last few weeks. working as hard as we are. I admire you and I appreciate you. But can you always stay on top? And Jerry is with us now. That was a great film. just got it back, they just won it. Democrats are going to do very well. President in his first year. because America voted for Clinton. so I am not sure of the comparison. Bernie Sanders the leader again? Trump, that's not the point. increasingly they have women, too. not a personality thing, but it is. under the rules of that election. outlook from older people in towns. here, other than being with us? tonight, but not for us. to a cave in Mayfair. and depressing news blows over. the taste away from the Blue Nun. Andrew Neil reviews the political week with Michael Portillo and Lisa Nandy, plus Liam Halligan with a film rounding up the headlines. Studio guests are former Kremlin advisor Alexander Nekrassov looking at why he thinks the UK is wrong to blame Russia and Theresa May is taking on Vladimir Putin to cover up her own problems, while Jerry Springer puts 'fighting back' in the spotlight section.